This feature is by my good, good friend FeroFero.com , the work and artist mentioned is too cool not to share. 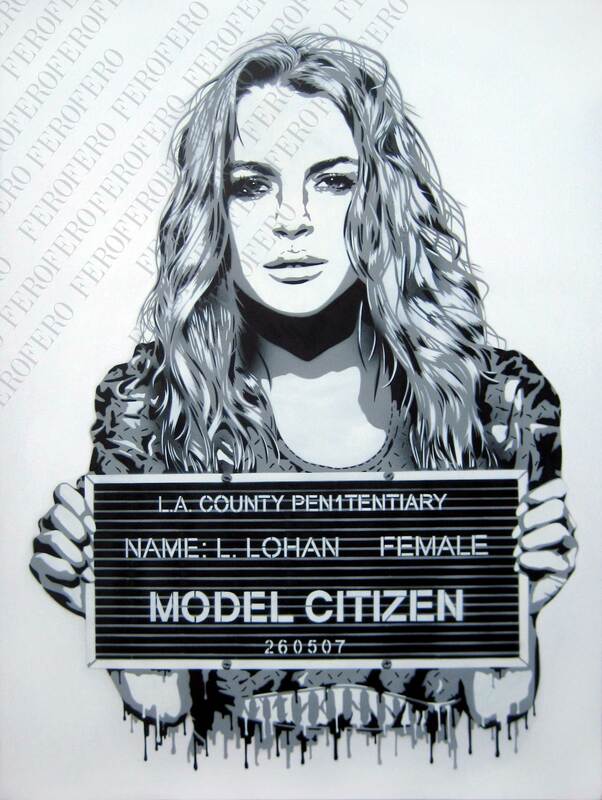 This image of Lindsay Lohan ‘Model Citizen’ mugshot was sprayed on a street in North London by street artist PEN 1 a day before she goes to prison. PEN 1 is a street artist with a ‘Say it like it is’ attitude . The recent mugshot image of Kate Moss holding a “Model Behaviour” board, sprayed on a wall in Shoreditch, caught both the public and media’s attention. Now comes PEN 1’s Lindsay Lohan “Model Citizen,” piece, proof of his ability to react at lightening speed to media and public opinion via the immediate execution of his work, this time in a street in North London. In his characteristic ‘say it like it is’ fashion, the LiLo piece is sure to raise a few eyebrows, just as the partygirl goes to prison. Little is known about the anonymous PEN 1 except that he can run extremely fast and will only meet up with his manager in carparks with bad light. A man of few words (the only quote he has ever given is, ‘I’d like to thank my Mum’) he leaves it up to the public and the media to voice social commentary surrounding his work. Social, political or anti-authoritarian in implication, PEN 1 is quick to relay it and quick to spray it. PEN 1 is exclusively signed to Beautiful Crime (who have still yet to meet him).